Several years ago when Keri Smith, bestselling author of Wreck This Journal, discovered cryptic handwritten notations in a worn copy of Walt Whitman’s Leaves of Grass, her interest was piqued. Little did she know at the time that those simple markings would become the basis of a years-long, life-changing exploration into a mysterious group known only as The Wander Society, as well as the subject of this book. 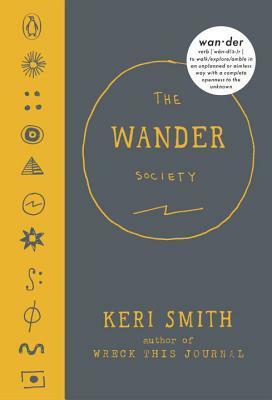 Within these pages, you’ll find the results of Smith’s research: A guide to the Wander Society, a secretive group that holds up the act of wandering, or unplanned exploring, as a way of life. You’ll learn about the group’s mysterious origins, meet fellow wanderers through time, discover how wandering feeds the creative mind, and learn how to best practice the art of wandering, should you choose to accept the mission. Many of you will have heard of the Wreck This Journal series (something I have recently gotten into, and will cover in a following post). WTJ is a concept that has gotten many people who consider themselves to be artisticially stunted (aka ME) to try something creative, even if it is 100% outside of their comfort zone. AND so, when Keri Smith has a book coming out about those who have a embedded stream of wanderlust in their system (me), feel constantly restless (me), and muffled by the electronically obsessed society they are a pat of (mostly me – but I do love myself some wifi), I knew I needed to check it out. Did any of you ever read the Unauthorized Autobiography by Lemony Snicket? That was one of my favorite books when I was growing up, and The Wander Society reminded me a lot of it. However, there was a very distressing aspect to it. I went into the book all ‘la la la, this is a fiction book made to make you think. There’s nothing true about it, I’m just along for the ride.’ But, it slowly started convincing me that it was, in fact, nonfiction. So, the entire time I was reading this, I was in battle with myself, trying to figure out if it was true or not (still not sure TBH). Anyways. This is a very intriguing read. I’m not sure how I felt about the actual content, but the concept was interesting, and the text did activate my wanderlust side. A good read for anyone who likes a quirky/unique writing style, that gets your mind working.